Developing a software plan can be a really tough and technically tricky job. However that is not the end of the story. What is more important is that this software needs to be developed from time to time. Software companies generally look for ready to use templates which save time and provide the basic structure for having a well-organized software development plan. 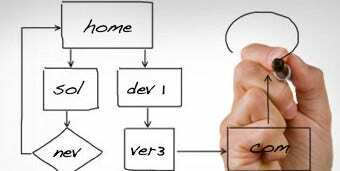 Here we present some handy software development plan templates that help in laying an easy to understand plan for software development. These planning formats can be easily downloaded by any user in the form of word document or even in the format of pdf. These templates have great responsive features that allow any user to navigate through the templates with a lot of ease. 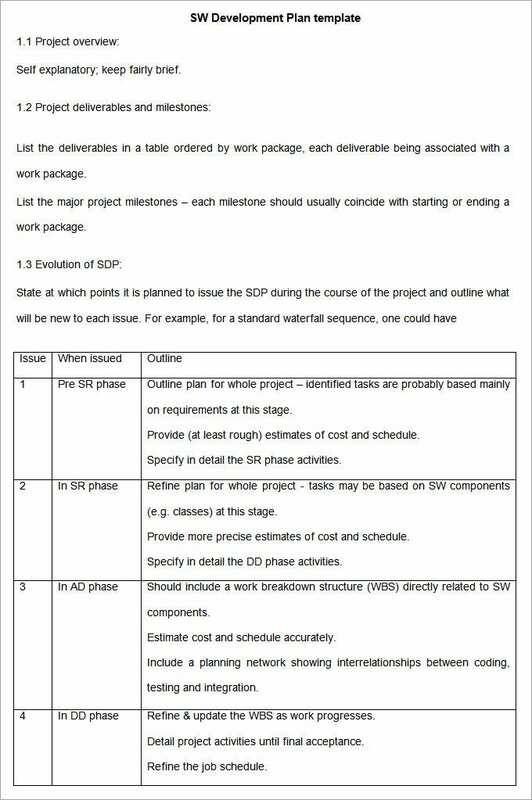 These software development plan templates are usually fully editable. The user can make changes and add information as per requirement. The look of the formats is highly formal and very neat. There is a grid pattern on these templates that allows the user to present his plan in a highly organized manner. These templates have a highly responsive feature. The design or the layout of the formats allows the user to make highly impressive software development plans. The design of the templates allows a paragraph style of writing. This also allows the user the write down the various important aspects of the plan such as the purpose, the scope and the part of the various definitions and also the references. The templates are fully editable and can be changed at any point. These are highly suitable templates that will be allowing the user to create a detailed and systematic structure of the software development plan. 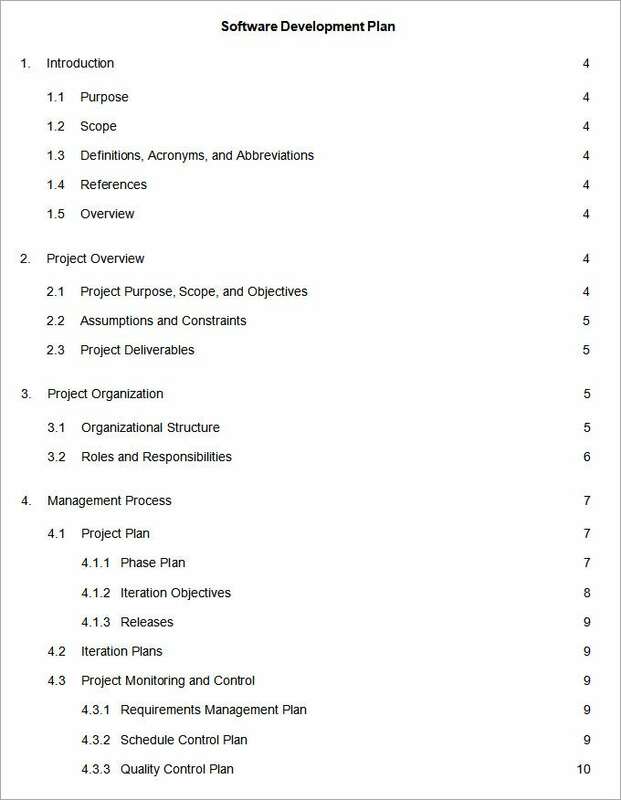 The entire template formats have been divided into parts that present parts of the discourse such as in the form of introduction, project overview, project organization etc. The overall look of the templates is very formal and has a very neat and tidy look. The user can make changes in the background of the templates as and when required. These templates have a great resolution that provides very good quality printouts. The structure of these templates offers a paragraph style of writing. 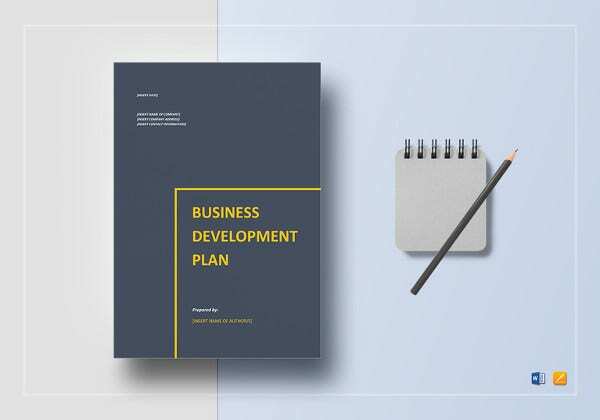 These templates can be used to create a software development business plan that will be illustrative and detailed in its nature and structure. 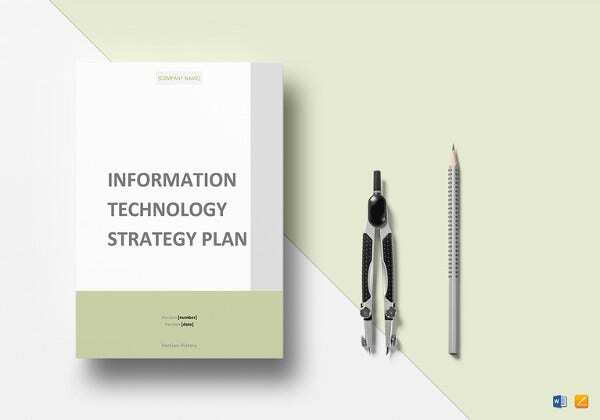 These templates can support information pertaining to the scope of the plan, purpose of the plan, various definitions and also acronyms and also abbreviations. Before you download one of the sample software development plan templates that we have got for free, you should know what a plan such as that is usually made up of. 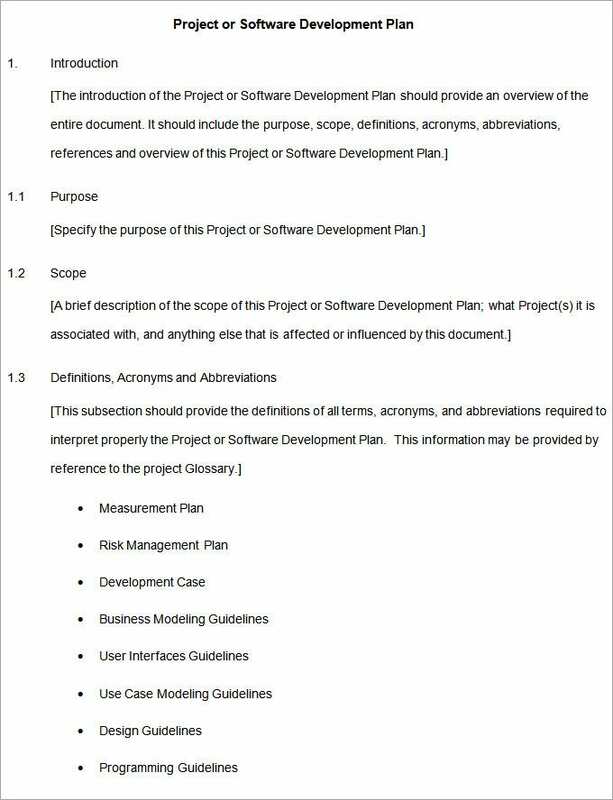 Here are all the components of a software development project plan listed out. All the details of the software in question are described in detail. A team that is to work on the software development planning of this software is then made. The development plan is then made and goals and deadlines are fixed that will here after be worked upon by the team. 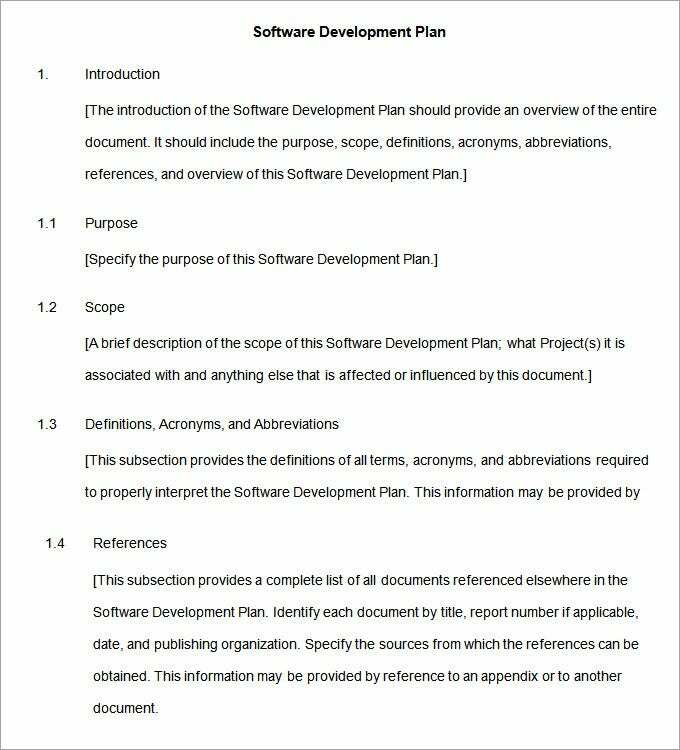 What is a Software Development Plan Template? A software development plan template is a very important document that will help you to make really impressive and effective plans of development of software. This document organizes the whole work and makes it much easier. 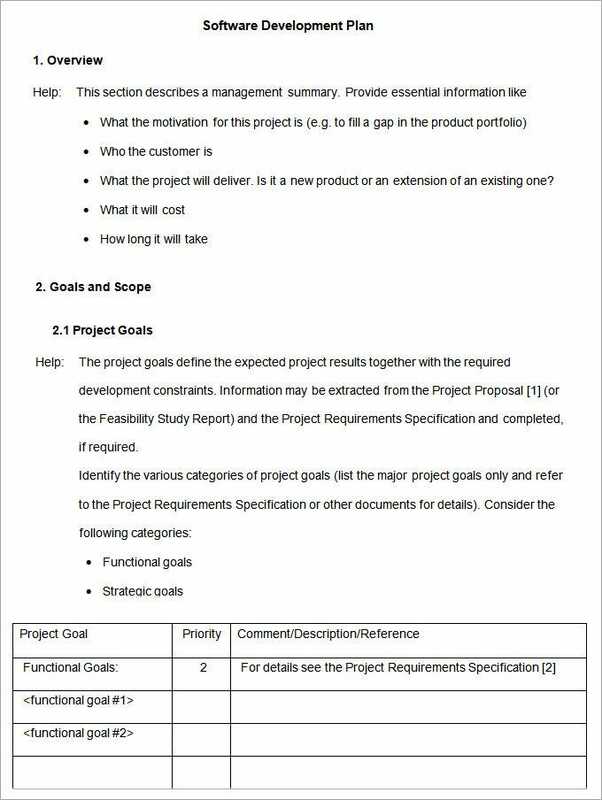 How to Make a Software Development Plan Template? Although software development is a work that is highly technical in nature making of a template for a good software development plan requires more systematic approach than much technical need. It is however imperative that you are aware of the various stages and the aspects that are involved in the task of template development. The most important benefit is that software development is a high complex and sometimes a lengthy job. Making a template of this process often helps the team to understand the various processes involved. Confusions and complexities are resolved and diminished. The Software Development Plan Template can be trusted on the fact that it really helps in the process of making detailed, systematic and professional software development plans. If you have any DMCA issues on this post, please contact us!